Named ranges are great. 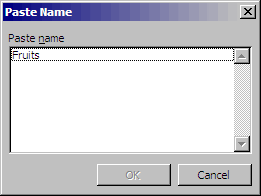 They allow the user to define a cell range with a single text-descriptor. For example, you could define the cell range of $A$1:$G$1 as the string “headings” and every time you wanted to refer to that cell range (in, say, a formula) you use the string “headings” instead. With appropriate “names” they can help explain what the range describes. They (usu.) reduce the size of the formula(s). They simplify reuse of the range. By keeping the named range in a single location, if the range needs to be updated, it only needs to be changed once. They reduce the chance of typographical errors when, particularly when used more than once. The specific process of creating a named is slightly different in Excel® 2003 and Excel® 2007, however ostensibly you go about it the same way. – Click on Define under the Name sub-menu of the Insert file menu. 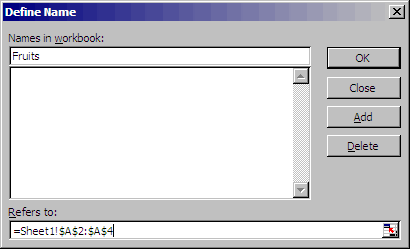 – Under Names in workbook: enter the name that describes the range. – Under Refers to: enter the cell range that you want described by the “name”. A neat trick to get access to the named ranges when you are entering your formulas is to press F3. This will give you a list of the named ranges for you to pick from. You can create ranges on individual columns, individual rows, or ranges that span many columns/rows. Named ranges make it really clear what you are trying to search for – much like object oriented programming (OOP), using named ranges in this way make it easier for other people to understand what your code/formulas are trying to do. They reduce the chance of errors and reduce the time needed to replicate/propogate formulas. Posted by Ryan Kirgan on Tuesday, May 4, 2010, at 5:08 pm. Filed under Excel Tips. Tagged excel, named ranges. Follow any responses to this post with its comments RSS feed. You can post a comment or trackback from your blog. Note: Dynamic named ranges will not appear in the Name Box dropdown list. 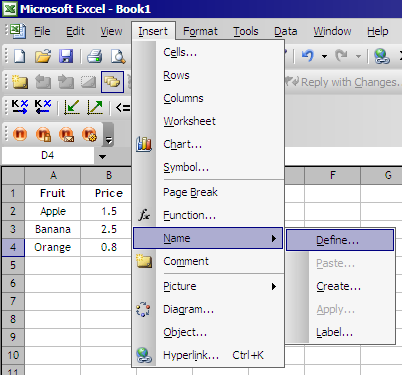 However, you can type the names in the Name Box, to select the range on the worksheet. Thanks for this Jimmy. I’ve never actually used the Name Box, so didn’t realise this to be the case. Generally when accessing a named range, I’ll either type the name as you have suggested, or press = and then F3 to paste the named range. Thanks for the comment – very interesting.